The spleen is the second most frequently injured abdominal organ in children. This is because it is not protected by the rib cage. The spleen is located in the left upper side of the abdomen, just under the rib cage. The spleen is an important part of the body’s defence against certain bacteria and infection. It also filters blood and removes old blood cells and other debris. Spleen injuries are graded according to the depth of the contusion or the laceration, from grade I (minor) to grade IV (shattering of the spleen). What are the common causes of a spleen injury in children and adolescents? What is the treatment for a spleen injury? Children with a spleen injury will be admitted to the hospital so they can be watched closely. Those with a grade IV injury are usually hospitalized in the Intensive Care Unit. Unstable children may need an emergency operation first. What are the complications following a spleen injury? Most children with a spleen injury are successfully treated without an operation. If the spleen has been removed, your child will need antibiotics and immunization against common bacteria. What happens once your child is discharged from the hospital following a spleen injury? 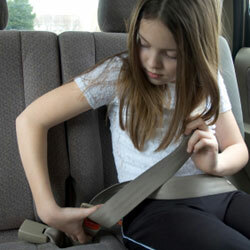 Always use the proper car seat , seat belt and shoulder harness when your child is riding in a car. Make sure your child wears proper safety gear at all times when playing sports.